FETS View integrates AERMOD (or CALPUFF) air dispersion modeling with emissions inventory tracking capabilities in one easy-to-use software system. This system is capable of tracking and storing very large amounts of data to manage facilities with many different emission release points and dozens or even hundreds of pollutants. FETS View allows you to locate information about your facility in seconds where it would be time consuming and cumbersome to find that information without it. The integrated air dispersion modeling will save you from a continuous cycle of creating input files, loading data files and tracking down output. FETS View’s detailed integrated GIS and graphics will make it easy to view modeling results for your site, analyze impacts and present results. Multiple Emissions Tracking Made Easy! Collect production rates and emission factors to determine facility-wide total emissions. Generate required AERMOD Modeling for all sources and all pollutants. 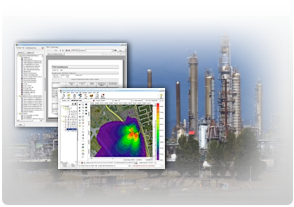 Manage and evaluate AERMOD modeling results from inventory. Compare modeling results to emission thresholds. Generate source summary and emissions summary tables for professionally designed reports at the touch of a button. These reports let you easily summarize your emissions by source type, pollutant, time period, process, and total emissions.